In a recent issue of The Pompey Chimes there was an article about Icon Painting Courses run by Mrs Jackie Hunt, Artist and Iconographer, at St Peter’s Church, Soberton. Having seen such icons in the Coptic Churches in Egypt and the Russian Churches in Tallinn and St Petersburg, Rod made application to go on such a course and was accepted in the summer of 2016. The class was of a week’s duration and intended to show how traditional icons were constructed and for the students to paint one. Each day started with a prayer and the whole sessions approached with diligence and reverence. 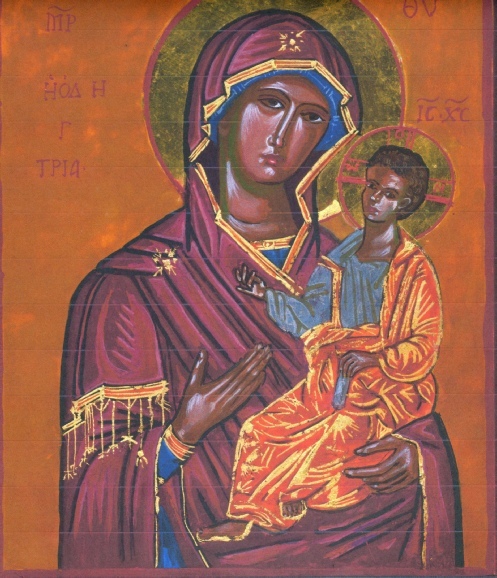 At the conclusion Rod painted an icon called The Hodegetria - representing the BVM with the Christ-child. The title means ‘The One who shows the Way’. Replete with symbolism, as for example - the folds in the mantle dress, the position of the hands, the stars and the head-dress - the whole work was a spiritual experience. An icon of the Eastern Orthodox Churches is an image. It is used for visual contemplation and veneration. Displays occur in front of the altar - the Iconostasis, in processions and domestically by the faithful. It is reputed that the first icons were made by St Luke who painted Mother and Child with the Infant Jesus (the Theodokos) and Saints Peter and Paul. In the Orthodox world the icon is regarded as ‘Theology in line and colour’ and as an aid to devotion, as with incense, ritual and ceremony and the representation of other religious symbols. In the Western world some denominations have deep reservation about the exhibiting of icons. They ally paintings as the worshipping of graven images. A similar iconoclastic response also occurred in the early Eastern Churches. After many violent arguments the matter was favourably resolved in the legitimacy of venerating the icons but not worshiping them. The former Archbishop of Canterbury, Rowan Williams, has written about icon painting and uses, concentrating on four works, Christ - the Transfiguration, the Resurrection, the Hospitality of Abraham (depicting the Trinity) and the Pantocractor (Christ in Glory). During the course, Rod engaged in important learning processes - the prepared board background, the use of egg-tempera painting using vegetable and mineral pigments and the application of leaf gold and transfer gold. His experience produced an icon called - The Hodegetria.